Sunday 10th August was a perfect Queensland winter's day, with cloudless blue skies and plenty of warm sunshine. Close to twenty Club members - with a good representation of models from new 147s to 105 Spiders - turned out for the drive to the seaside at Redcliffe Peninsular, north of Brisbane. Our destination was the famous Fishbowl Restaurant and Bar, where our group was booked in for lunch . (Webmaster's note: Sadly, the Fishbowl closed for business in 2005). Upon arrival at Redcliffe, our Social Secretary, Kim Percival, sent the group off on a Treasure Hunt that saw us scouring the beachfront and surrounding shops for various items. Some requirements were quite cryptic and our imagination, as well as our legs, had to be exercised to obtain the necessary things, for example: a CD for a "120mm round mirror" and a lolly for a "ball that disappears". 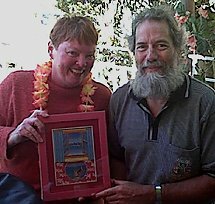 Jude and Tony Vaughan took out Treasure Hunt honours with the most number of items collected. One thing on the list, however, defeated everyone - there was no trace of cuttlefish anywhere on the foreshore, Redcliffe Council's beach-cleaning machines having seen to that! Some debate arose over the "bonus question"; the name of the shipwreck at the foot of the Woody Point cliffs. For those who want to find out more about HMQS/HMAS Gayundah, check out this link: http://www.geocities.com/janeys_redcliffe/places/gayundah.htm. With the fun and games out of the way, we got down to the serious business of lunch. The Fishbowl is a favourite destination for quite a few car clubs (on this day the Monaro Club was also in attendance) and our hostess, Carmel Bullivant, made us feel right at home by arranging for an automotive-flavoured table setting, including chequered tablecloth and oilcan memorabilia. The Fishbowl almost defies description. It's decor has a 1950's flavour, but with definite humourous twists. There's certainly plenty of anodised aluminium and laminex, but I'm sure most homes in the 1950's didn't have a stuffed tiger in the loungeroom or fishbowl in their television! The venue has an abundance of greenery scattered around - both real and fake - and one particular palm tree seemed intent on attacking some members at our table. The menu is as fun and interesting as the decor, but perhaps captured by the seaside location, most of the group opted for seafood dishes. 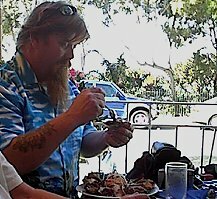 Our President, Ken Percival, certainly made short work of his entree of oysters. Those who ordered the battered fish for mains, were presented with neat newspaper-wrapped bundles, reminiscent of the corner fish 'n chip shop. Closer inspection revealed that the "newspaper" was actually a custom printed sheet, with reproductions of period advertisements. None of the adverts were for Alfa Romeos, though! A variety of wines and beers were on offer from the bar, although some club members went all the way with cocktails and particularly wicked-looking alcoholic "milkshakes" called Chocolate Bunnies. The Fishbowl also features lunchtime fashion parades in which relatives and friends of the owner model clothing from the 1950s and 1960s, including lingerie and sleepwear. Female Club members old enough to remember winced at the sight of the various straps, buckles, belts and restraining devices used to contain the feminine form in the 50s. One of the male models, resplendent in 1960s velvet trousers, did his own impression of Austin Powers. With the main course out of the way, it was time for dessert. And there were plenty to choose from, including old favorites such as cheesecake and lemon meringue pie. Jude and Tony Vaughan opted for a concoction called a "Toblerone Mousse" while one end of the table seemed positively covered in a mountain of waffles and ice cream. While we were attacking our desserts, a passing Alfa GTV owner, newly arrived in Queensland from Victoria, noticed the lineup of Alfas parked outside and called in to inquire about Club membership. Coffee and tea finished things of nicely, then it was time to bid The Fishbowl farewell. Some members took advantage to the beautiful weather to go for a leisurely stroll along the breach, while others checked out the shops before heading home. All in all, a very pleasant outing.